I’ve recently migrated Dona Rita’s website from Jekyll to Gatsby. I’d like to share my process with you, as well as a few tips about building a JAMstack site with Gatsby, Netlify and Netlify CMS. The original Dona Rita website was built with Jekyll and hosted on Github Pages. It was built in an MVP approach, you can read more about that here. Overall, it was working well, but let’s be honest… Liquid partials are not React components. When I decided to change my setup from Jekyll to Gatsby, I wasn’t quite sure how much work/effort that’d be. I wanted to keep things as simple as possible. In the end I think I was able to find a nice process. I started by reading Gatsby’s documentation. They also wrote a neat tutorial. Gatsby works differently than Jekyll, so it’s worth giving these a read first. I used the gatsby-starter-hello-world. This is probably the simplest starter you can use. I chose this because I wanted to start with bare minimum configuration. I find it easier to learn a framework this way. Anything you add to a Layout Component will be shared amongst all other pages. This is particularly useful for global components, such as Navigation or Footer. You can see the source code for my layout here. I started by creating stateless Page Components. 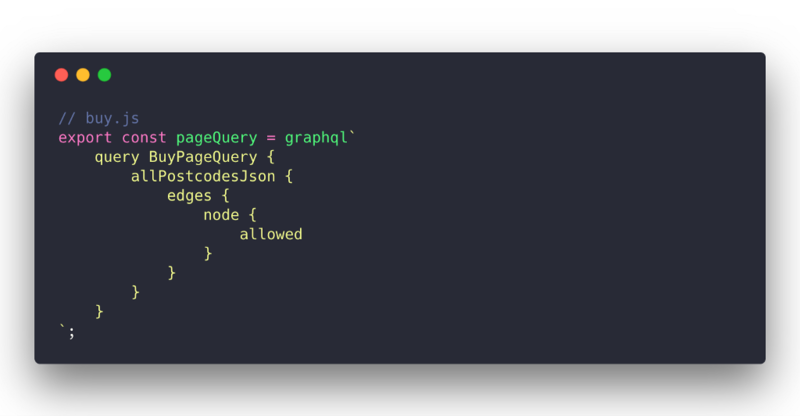 The point here was to start getting a feel for how Gatsby creates pages, without having to worry about GraphQL. I left stateful pages (pages that depend on data) and dynamic pages (pages that will be generated from Markdown files) for later. The first page I added was the Ingredients page, you can see the source code here. The original Dona Rita website was styled with global CSS, written in Sass. To keep things moving, I decided to keep this approach instead of converting my styles to Styled Components. In order for Gatsby to process Sass files, you need install gatsby-plugin-sass (drop-in support, works like a charm). Because I needed to inject the styles globally, I imported them in my Layout file. By now I had a few static pages rendered and styled correctly. I was becoming more comfortable with Gatsby and I was ready to create my first stateful page. I decided to start with the Buy Page. For this page I needed to get access to a list of allowed postcodes which I will be passed down to my Product Component to determine whether we can deliver there or not. 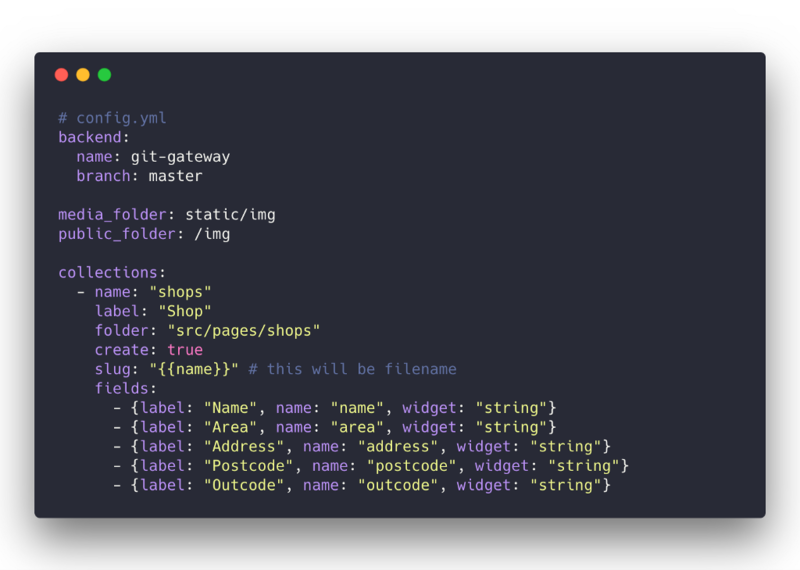 I created a file called postcodes.json in a src/data/ directory and installed the following dependencies: gatsby-source-filesystem and gatsby-transformer-json. Here’s source code for the JSON file and here’s the source code for the Buy page. #protip: Gatsby has a really nice tutorial to help understand its data layer. Definitely worth a read. Once most of my stateless and stateful pages were created, I took a bit of time to refactor some parts of the code. I created a src/components/ folder and added a few components to help improve maintainability of the project. Here’s a list of the components I abstracted. 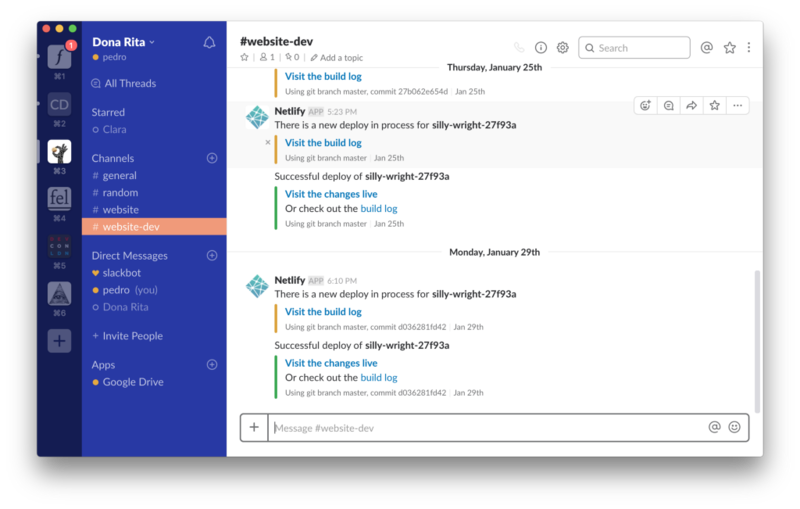 I was happy with Github Pages, but Netlify is so good, so fast, so easy to use that it’s hard to say no… it offers instant rollbacks, one-click SSL, prerendering, deploy previews, and many more awesome features. When a new Pull Request is created, Netlify automatically generates a Deploy Preview. This feature is pure gold. It allows you and other members of the team to see how the changes affect the project. Netlify CMS is an open source content management system for Git workflows. I decided to give it a try as it seemed surprisingly simple. The way I set it up was by authenticating Netlify CMS with Github via Netlify Identity. As with anything Netlify related, it was only a couple of clicks. I used Netlify CMS to manage my “Shops” data. The way I am managing this data is by having one Markdown file per Shop. You can see the source for the Shops page here. I also created a configuration file. Through this file I was able to create collections and to define which fields can be modified via the CMS. You can see the source for Netlify config here. If you’re interested in adding a CMS to your static site, I’d definitely recommend using Netlify CMS. You can read the docs here. I’m really happy with these changes. Gatsby, Netlify and Netlify CMS are all game changers. And when used together, they work in complete harmony. If you’re as interested in JAMstack as I do, I’d highly recommend using these tools. The initial Jekyll-to-Gatsby migration took me about 6 hours (including having to learn Gatsby and GraphQL). The code for Dona Rita’s website is public on Github. Feel free to browse around! Please refer to the official migration guide here. JAMstack with Gatsby, Netlify and Netlify CMS was originally published in Netlify on Medium, where people are continuing the conversation by highlighting and responding to this story.